8/11 Cup of Coffee: The Red Sox have seen a lot of good play in the lower levels of the minors this season, and that trend continued on Monday. Top draftee Andrew Benintendi (pictured, left) continues to impress, leading Lowell to victory. The GCL Red Sox have responded well to a packed recent schedule, sweeping a doubleheader to extend their winning streak to five games. Pawtucket finally got to play a different opponent, but the result was unfortunately the same, as they dropped a crazy walk-off--which did not involve any walking--to fall to their eighth straight loss. At least it was someone other than the Syracuse Chiefs. After dropping seven consecutive games in a brutal home-and-home stretch with the Washington Nationals affiliate, the PawSox were probably happy to see a different uniform across the field. Unfortunately, that happiness did not manifest itself in a different result, as the PawSox continue reeling. Matt Barnes made his second start in his return to the starting rotation. The right-hander pitched out of a few jams, allowing only one run in 4 2/3 despite allowing six hits and walking three. Barnes also struck out five on the night. Dayan Diaz was solid out of the bullpen giving up two hits in 2 2/3 scoreless frames, striking out four against two walks. Heath Hembree came on to strike out the last two batters of the eighth inning. Ben Gamel (NYY) led off the bottom of the ninth with a sinking line drive that right fielder Jonathan Roof attempted to make a diving catch on. Roof skidded short of the catch, and the ball bounded past him to the wall. This allowed Gamel enough time to race around the bases for a game-winning inside-the-park home run. It was an appropriate way for the PawSox to drop their eighth in a row and for the 33rd time in their last 39. 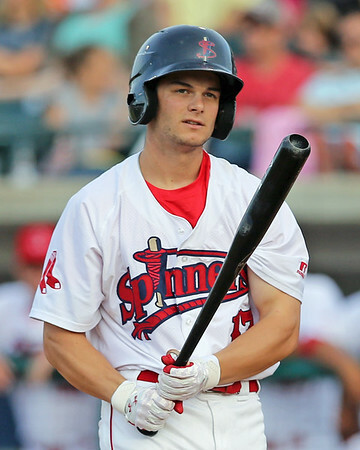 With a home run, three walks, and a stolen base, Andrew Benintendi continues to put up video game numbers against New York-Penn League competition. The home run was his fifth of the season, coming with nobody on in the top of the first. ValleyCat pitching wanted nothing to do with the seventh overall pick in the 2015 draft from then on, walking him three times, including once intentionally. It was the first intentional pass Benintendi has been issued as a professional. Brandon Magee had his best game of the season as he attempts to transition from the gridiron to the diamond. The 2012 draftee launched his first professional homer in the fifth inning, and added a double, a walk, and a pair of stolen bases. Tenth-round pick Mitchell Gunsolus had two hits including a double. Jose Almonte overcame a very difficult first inning to turn in what became a solid performance. Almonte allowed three hits, two walks, and a wild pitch in a four-run first inning. Despite throwing 31 pitches in that frame, the Spinners brought him out for additional work. That decision paid dividends, as Almonte did not allow a hit over his final three innings. Matt Kent pitched 3 2/3 innings of scoreless relief to earn the win, moving to 5-0 on the year. Trevor Kelley tossed the final 1 1/3 to pick up a save. It was another solid outing for starter Logan Allen as the Sox held on to take the opener. Allen, Boston's eighth-round pick who received a signing bonus in line with being a second rounder, allowed two hits in three scoreless innings. He struck out three, and faced only one batter over the minimum because of a caught stealing. Pat Goetze got credit for the win, giving up the two runs on five hits in his three innings of relief. Adam Lau tossed a scoreless seventh for the save. Roldani Baldwin (pictured, right) keyed the offense, delivering two of the team's four hits and scoring two of the three runs. Baldwin doubled for the fourth time this year, and Luis Alejandro Basabe added his fifth two-bagger of 2015. Enmanuel De Jesus and Carlos Garcia limited the Orioles to only three hits to complete the sweep of the twinbill. De Jesus got the start, allowing three hits and an unearned run in 5 2/3. He struck out three and walked two, lowering his ERA to 2.23, eighth best in the circuit among pitchers with 30 or more innings. Garcia threw 1 1/3 innings of hitless relief to earn the save. Andy Perez was at the center of the offense, going 3 for 4 with a pair of runs driven in. Baldwin added another hit, extending his modest streak to six games. With the victory, the Sox have now won 10 of their 11 August contests, opening up a seven-game lead in the GCL South division. The magic number to clinch the division and a spot in the playoffs is down to 11. The Red Sox1 squad ended up on the short end of a strong pitchers duel. Christopher Acosta, signed to a $1.5 million bonus last summer, had his best start of the season. The Dominican right-hander tossed five shutout innings, allowing only one hit. He struck out four without issuing a walk. In three starts since returning from the disabled list, Acosta has given up only two runs in 11 innings and he has not walked a batter. Nicolo Clemente was saddled with the loss despite not surrendering a hit in three innings. Clemente allowed the games only run in the sixth inning, when a walk was followed by a ground out and an error. A quartet of Mets pitchers one-hit the Red Sox1 offense, with a third-inning double off the bat of Eduard Conde. Nearly everything went well for the second DSL squad. Starter Darwinzon Hernandez was dominant, striking out nine against three walks and allowing only three hits and an unearned run in five innings. Warly Guzman and Marcos Lantigua tossed two scoreless frames apiece while the offense wreaked havoc on Yankee pitching. Designated hitter Ramfis Berroa led the charge, notching a double and triple in four at-bats, scoring and driving in two runs apiece. 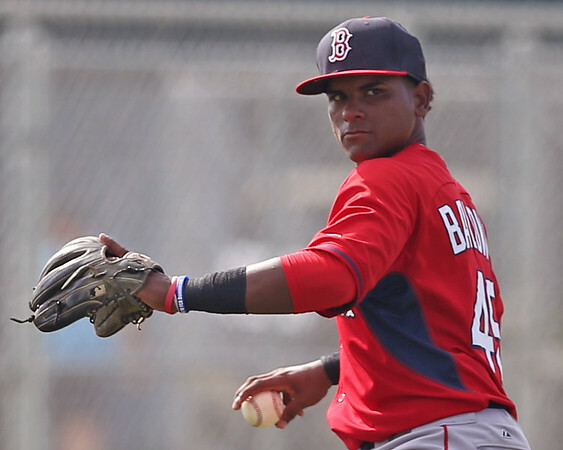 Player of the Day: Roldani Baldwin gets the nod for his role in helping the GCL Red Sox sweep their doubleheader. Across the two contests, Baldwin was 3 for 6, scoring twice and providing the difference in the opener. He has hit safely in six straight games, helping open up a seven-game lead in the push for the postseason..